It’s been a wet and icky weekend here in New England, a bit reminiscent of Fall. This morning was a perfect time to make some pumpkin pancakes. I used frozen pumpkin puree. I cooked and pureed the pumpkin then froze it in 1 cup measurements. Caveat, upon thawing, push out any extra liquid by dumping the pumpkin into a fine mesh strained and squishing it with a large spatula. You can also use canned pumpkin for this. These pancakes are great for little self-feeders and will also travel well in lunchboxes for your older kiddo. Make a double batch and then freeze the extras for quick and nutritious breakfasts! 8 months+ due to egg & milk & wheat or as your pedi recommends. Step 1: Stir (and sift) together all the dry ingredients in a med. size bowl. Step 2: Beat the eggs with the pumpkin & vanilla then beat in the milk & butter until smooth. Step 3: Add wet ingredients to the flour mixture. Step 4: Preheat a griddle to 375F or preheat a frying pan on medium. Pour the batter in 1/4 cup measurements onto the pan or griddle – I use a 1 cup glass measuring cup and pour from this. Cook until you see bubbles then turn over and cook other side until pancakes are golden. Serve warm. Step 5: Due to pumpkin and whole wheat flour, pancakes will be more heavy and dense than what you get when you use a boxed mix for buttermilk pancakes. You could increase the baking powder by 1 or 2 teaspoons if you like to get a lighter (though still heavy/dense) texture. ***** If you will be using a cookie cutter or other type device to make shaped pancakes, you may want to lightly grease the inside of the cutter. 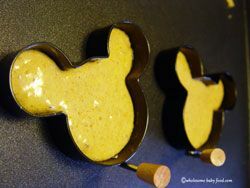 My Mickey egg/pancake cookers are coated. It is VERY important that you not remove the pancakes from the cutters until you see lots of bubbles and can tell the pancake is almost cooked. You may also need to gently poke out the pancakes using the tip of a spatula.